Looking for growth stocks to supercharge your portfolio? Here are three companies that might be exactly what you're looking for. Looking to grab on to a rocket for your portfolio? These growth stocks might lift you to new heights. Growth stocks are a great way to boost your portfolio. After all, every blue-chip stock out there was once a fledgling start-up, or a company still early in its trajectory toward industry dominance. In our search for great growth stock ideas, we asked three of our top contributors, "What's a growth stock that could double in price over the next 12 months?" Then we made them tell us why. Here's a look at the companies they offered up, and what they had to say about them. Evan Niu, CFA: I'm among the LinkedIn (NYSE:LNKD.DL) bulls who think the 40% sell-off earlier this year following fourth-quarter earnings was way overdone and unwarranted. There were some clear soft spots in the fourth-quarter figures, and guidance was definitely conservative, but 40%? Really? LinkedIn's first-quarter results were more encouraging and showed some stabilization. Engagement is on the rise, and management said that a lot of the initiatives it's been investing in over the past few years are starting to pay off. The professional networker is also enjoying record levels of activity in its job listings, particularly among job applicants from the newly redesigned mobile app. The company is still very much in growth mode, with the core Talent Solutions business putting up a 41% jump in sales to $558 million. The Learning and Development business, derived from the Lynda.com acquisition, is still incredibly young (only $55 million in sales last quarter), as is the China opportunity. But when a stock loses half of its value over such a short period of time, it has to double just to get back to where it was. With shares now trading in the neighborhood of $130, it might seem daunting for the stock to climb back to levels around $250. If LinkedIn continues to execute on its growth plans over the next year, I think it has a chance to rebound. George Budwell: The clinical-stage biotech Geron Corp. (NASDAQ:GERN) could easily double if its first-in-class telomerase inhibitor, imetelstat, proves to be a disease-modifying treatment for either (or both) myelofibrosis (MF) or myelodysplastic syndromes (MDS). After all, the drug's first two indications each have the potential to generate megablockbuster-type sales figures, which is a particularly intriguing prospect when pitted against the biotech's present market cap of roughly $450 million. So why is Geron trading trading at such a deep discount relative to imetelstat's commercial potential? Unfortunately, there are a couple of good reasons to explain this apparent discrepancy. First off, imetelstat has posted a worrisome safety profile throughout the course of its clinical program, leading the FDA to place a partial clinical hold on the drug for a few months back in 2014. As such, the drug's safety issues could prevent it from either completing a late-stage trial, or earn it an extremely restrictive label upon approval that would significantly curb its commercial potential. Apart from these well-documented safety concerns, imetelstat still has a long way to go in terms of reaching a pivotal stage readout -- with Geron's partner Johnson & Johnson just now beginning the drug's advanced round of clinical trials for MF and MDS. As the drug's clinical program matures and presumably meets its pre-defined risk-to-benefit milestones along the way, though, Geron's valuation should rise, perhaps markedly so, as well. That said, investors shouldn't take Geron's hefty risk profile lightly, as a major clinical hiccup would almost certainly cause its shares to crater in the blink of an eye. 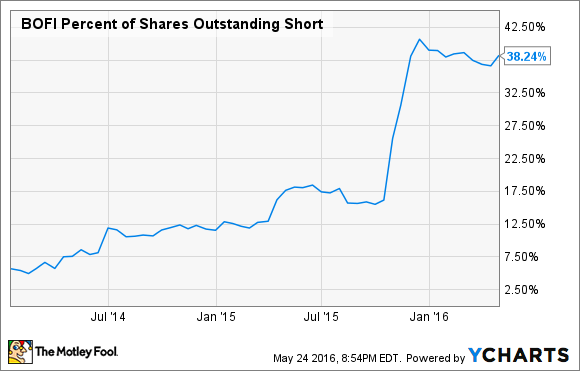 Why do I think a short squeeze could happen? Because none of the allegations against BofI Holding have held water so far, and the bank has continued to generate remarkable growth and profits. BofI Holding keeps growing its deposit assets, underwrite more loans, and expand into new and more diverse lines of lending, including a deal with H&R Block, and even more recently a move to acquire a business equipment leasing operation. Furthermore, the bank also disclosed a significant amount of information about its loan portfolio on its most recent earnings call, giving a much clearer picture of the relatively low-risk nature of its loan business. 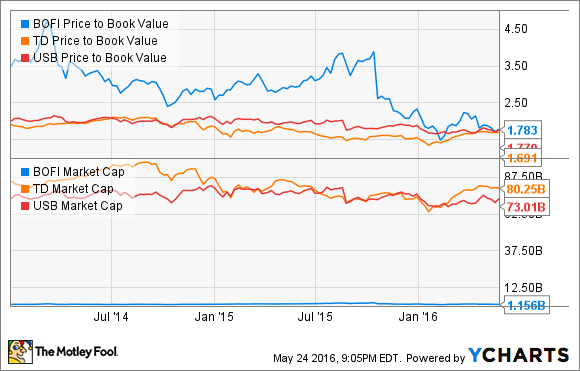 Bottom line: BofI is very, very cheap for a high-quality growth stock. Once the market realizes these anonymous short attacks are baseless -- something that only time and continued excellent performance will do -- this could be a squeeze of epic proportions, with nearly 40% of shares outstanding held short today.